Amphibians display some interesting and changing characteristics as they metamorphose through various forms on their way to adulthood. The frog, for instance, begins life underwater as a larva with gills and becomes and air-breather with lungs as an adult. "Amphibian" is based on a Greek term meaning "two lives." 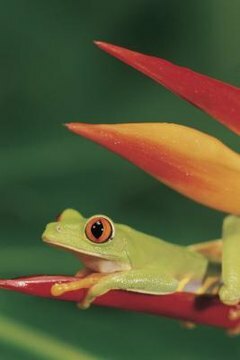 Amphibians are vertebrates, like humans, but they rely on their environment to regulate body temperature. As the earliest four-legged descendants of fish, they begin their lives in water, using gills for breathing. In adulthood, they retain the ability to live in water, as they can absorb oxygen through their skin. Most metamorphose into land dwellers, as well, and develop lungs for breathing on land. However, amphibian lungs are quite different from those of mammals or birds. Because adult amphibians live both on land and in water, many develop lungs in addition to absorbing oxygen from their aquatic environment. Water is rich in oxygen and therefore easily diffuses through the skin surface and into the oxygen-seeking blood vessels close to the surface. When on land, many amphibians breathe through lungs as well as through their skin, while some -- such as four-toed salamanders -- breathe only through their skin. Amphibian lungs are essentially empty balloons, far less complex than your lungs. While ribs and the diaphragm assist in your breathing through expansion and compression, amphibians instead use "buccal pumping" to pull air through the nostrils into the mouth and into the lungs. Muscles open and close the throat to allow air in and out of the lungs. While lungs are often thought to be a feature separating fish from amphibians, some amphibians never develop adult lungs. Four-toed salamanders and the newly discovered Caecilita iwokramae, a legless, lungless worm, are a couple of this variety. Why some amphibians possess lungs and others do not is not fully understood, but scientists expect to discover more of each in years to come. Amphibian Ark: What Are Amphibians? What Is the Classification of a Bullfrog?